Upstate Dispatch gets up close and personal with Steve and Kristie Burnett of Bovina’s Burnett Farms. Middleburgh’s Barber’s Farm has opened its pick-your-own veggies fields: tomatoes, sweet and hot peppers and eggplant are ready for harvest at $18/bushel. Hours are 9 a.m. to 5 p.m. daily, weather depending. Bring your own containers. Details on the farm’s Facebook page. The Food Network show that features Catskill food producers Northern Farmhouse Pasta and Catskill Food Co. has adjusted its schedule slightly. The episode showcasing the Roscoe pasta shop and restaurant will air this Saturday, Aug. 29, at 3:30 p.m. instead of tonight, and Northern Farmhouse welcomes fans to watch the broadcast. The episode featuring the Delhi sausage-maker airs Sept. 5 at 3:30 p.m. Read our story about Great American Food Finds‘ Catskill adventures here. 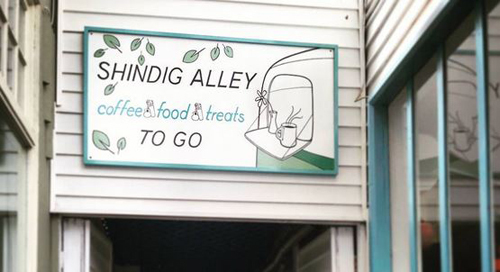 Woodstock’s Shindig, still basking in some big-city critic love from Eater New York, has opened a takeout window serving to-go “coffee, food and treats” including lobster rolls and banana bread pudding. All Over Albany’s advice on how to spend 12 hours in the Catskills includes lots of local favorite food stops, including Tannersville’s Twin Peaks Coffee and Donuts, Round Top’s Hartmann’s Kaffeehaus and Woodstock’s Cucina.